She started the morning out with a blood transfusion which went great. 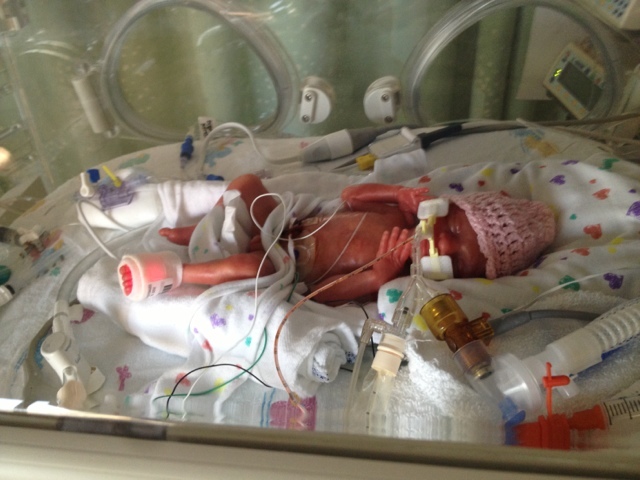 She will continue to need them, they are considered a normal process for "micro preemies". She will continue to have X-rays daily & tests done every 4 hours to monitor her for the 1st couple weeks I believe. She has been on room air & no oxygen. She will likely need it in the future though. She does have a ventilator to breathe for her. But she does initiate breaths on her own. Her blood pressure was low so they put her on some meds. She has done well & I believe by tonight she was weened off. I am learning slowly not to fall apart with every alarm. She will have spells, we just need to get through them 1 at a time. Briella was baptized today. The nurses found her a hat little enough to wear since she couldn't be in a baptismal gown they wanted her to still look pretty. 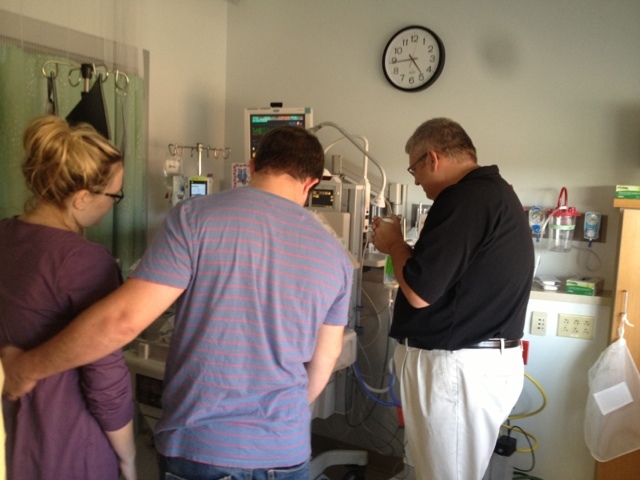 I am so overwhelmingly pleased with the NICU staff. They are the most kind souls. I feel like when I'm not there Briella is definitely getting love. Big sister Aubrey got to come visit today. Aubrey said she was very cute & has big feet. Briella's diapers are smaller than Aubrey's doll diapers by about half the size. After speaking with Drs, nurses & Brian & I discussing it with ourselves, we've learned a little more about her delivery. As much pain & agony as I was in & angry over no pain meds, I understand now that it was Gods will & He was with me the whole time. If you read the update about the chaotic birth, well here's some more details. I was in too much pain to be paying attention to the monitors. But Brian says he knew exactly when the mood in the room changed & stuff hit the fan. 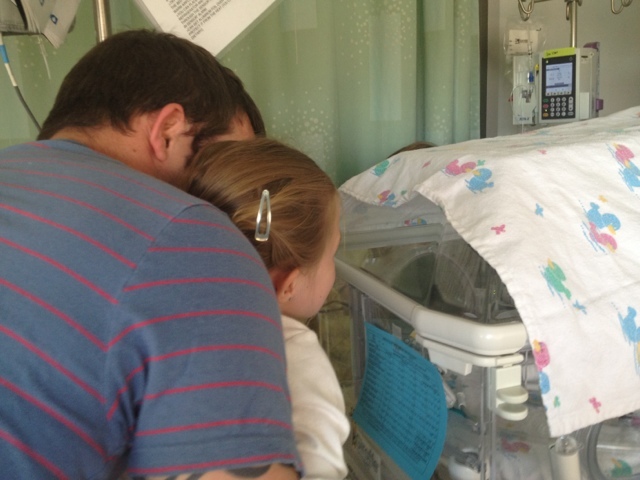 During all the pain, her heartbeat dropped off the monitor. They could still see it, it had just bottomed. My nurse had pulled the "emergency string" in my room & within minutes incubators & tons of people were there. When I was telling them she was coming, the nurses were looking & telling me no that I was having a very large hemorrhage. My water had not broke, so what the nurses were seeing was my entire sac coming out. This apparently is very rare. That is why they didn't realize baby was coming. When the in call OB checked me, I heard him tell the nurse that baby was right there. What had happened was that my partial abruption placenta became completely detached from my wall. 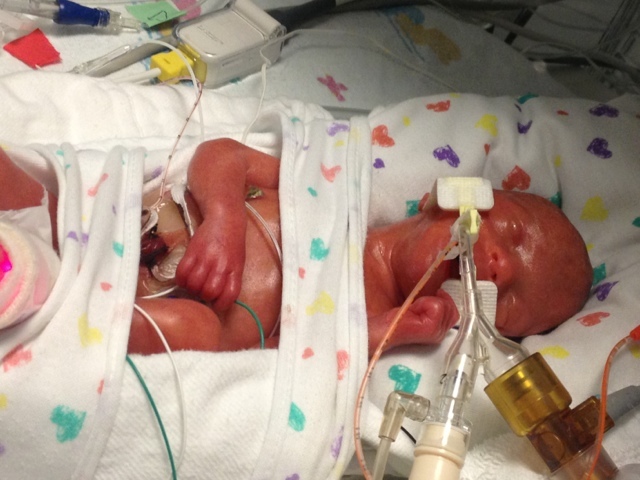 We were told months ago if that happened then the baby has less than 2 minutes to survive due to no oxygen. If I would've had a c section that would've taken 30 minutes. Brian had seen the sac come out, but thought it was afterbirth. He was still waiting & watching for the baby to come out next. He says he looked over & saw them working on her & had no idea how she got over there. They had to cut her out of her sac. There was no cord to cut because everything had already detached itself. Apparently micro preemies who are born vaginally have a lot of bruising & their body has to work on healing that the 1st few days. However, because she was born inside her sac, she had no bruising. It protected her coming out. And also protected me from hemorrhaging. There was such a small window of time for her to be born alive. There is no other explanation of all of the things that "went wrong" so that she would be born to have a fighting chance other than God's will. Please pray for her caregivers to have the knowledge to give her the best possible care & for her to stay clear of major complications. She is just beautiful. I'm praying for you and your family. remember, God is Always in control. never loose hope. 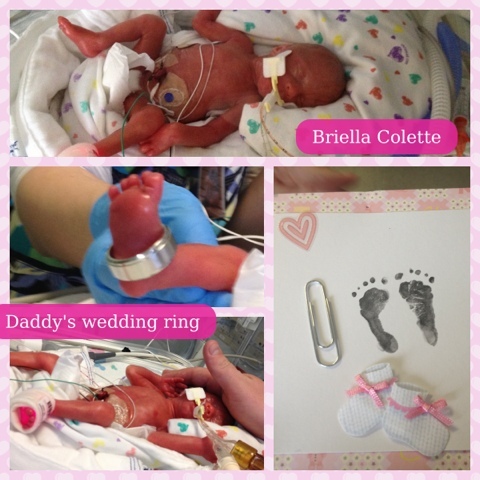 I'm very touched by your and Briella's journey. Keeping you both in my prayers!